Minions: Banana! – The Comic-Book Review | Warped Factor - Words in the Key of Geek. Tony Fyler goes looking for his banana. 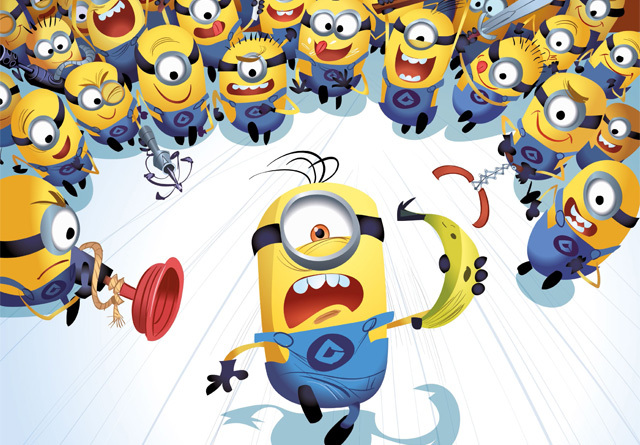 The appeal of the minions as comic characters lies in a combination of their cuteness, their obsession with doing mischievous things and their interaction together. They work on film superbly because they’re able to match sight gags with a non-verbal (or at least a barely understandable) language that nevertheless heightens their comedic, childlike antics. The lack of any understandable language, you might think, would be a significant barrier to their success in the comic-book medium. On the evidence of this 50-page collection, you’d be roughly half right. The thing about the minions is they don’t technically need an understandable written or spoken language – they make their intentions plain, and from the intentions and the application of their will comes the comedy. That actually works in a comic-book form, because a speech bubble full of intent or emotion works just as well as a speech-bubble full of…erm, well speech…to convey the basis from which the comedy can flow. In this collection, the minions ‘speak’ in pictograms as often as not, with only chuntering or exclamations – Arrrrrrrrrgh etc – being written in words, beyond of course their beloved ‘Banana!’ So you get minions saying ‘picture of a knife’ when they need a knife, or ‘picture of a thumbs up’ to express appreciation. While making for a somewhat ‘silent’ comic-book experience, it’s true to the on-screen spirit of the minions, and it gets the job done. That said, these 50 pages are, by the lack of speech, largely confined within the context of one-page gaggery. Panel one sets up the dilemma, most of the rest of the panels build on the dilemma, and the final panel either pays off the gag or puts it into a broader context that makes you smile or chuckle. That’s the point – there’s little here to go beyond a smile or a chuckle for the legions of grown-up minions fans. But, on the other hand, young minions fans are likely to laugh out loud at this collection, partly because of the simplicity and occasionally repetitive nature of the gags, partly because the lack of language makes the gags accessible multi-nationally and to those at different reading levels, and partly because this is a fairly pure minions product, aimed at bringing their fundamentally childlike nature to the fore. 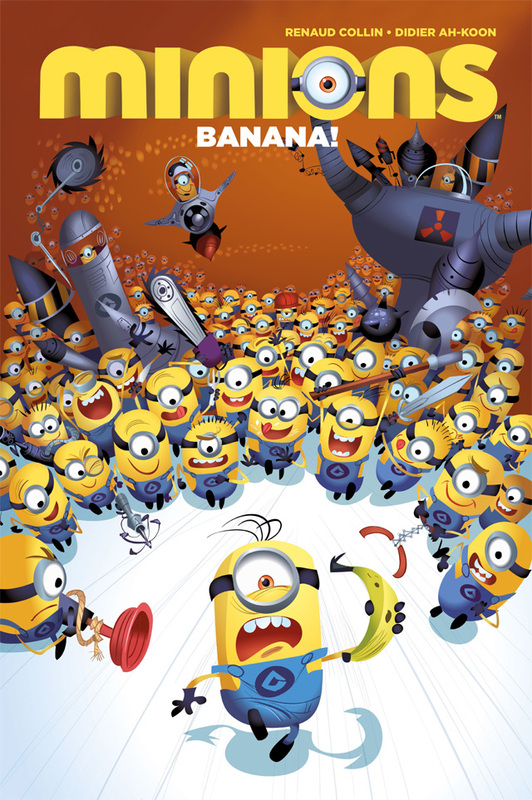 The artwork, by Renaud Collin, is more or less consistent with the on-screen minions, although the lines are softened somewhat in their comic-book world, and Didier Ah-Koon’s stories do tap into a certain single-mindedness which is crucial to the minions being as funny as they are. There’s frequently a point or a moral to the one-page gags – like the story of the minion who’s stopped and searched on his way to work, and has a pen-knife removed from his person, which is funny only because in the last panel, he’s shown to work in the weapons store, and again, for a younger audience the collection should provide several hours of bright yellow ‘look, here’s the minions in this situation’ fun. There’s a point here about the appropriation of characters aimed at a younger audience by an older, geeky scene: many of those going to see the new minions movie will be geeks going to see it because the minions are funny on several levels at once, and they’ve been taken to their hearts by geeks around the world. That audience should probably save their money when it comes to this comic-book. It’s not really aimed at them, but at the original minions audience – the young Despicable Me audience that love the minions because what the little yellow world-conquerors are at their core is children. Super-clever, single-minded children, ready to be used by any evil genius who feeds their basic needs. And it’s on that level that this comic-book works – it puts little yellow creatures with the simple, linear mindset of children through fifty pages of scenarios, to make children laugh. Get in touch with your inner 8-year-old – the one with the minion-style curiosity and sense of mischief – and this will make you laugh more than if you come to it as a grown-up geek looking for sophisticated, complex giggles.